Biskupia 21 is a cozy studio apartment located on the 3rd floor in a fully renovated building with an elevator. It is equipped with 2 single beds and sofa bed (it can accomodate up to 3 people). 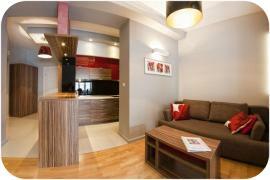 Fully equipped kitchenette, free wireless internet, Satellite TV and towels avilable in the apartment.